BRUSSELS (Reuters) - Far-right parties from France, the Netherlands and Italy said on Monday they had enough support to form an anti-European Union group in the European Parliament, although it was not immediately clear who would take part. 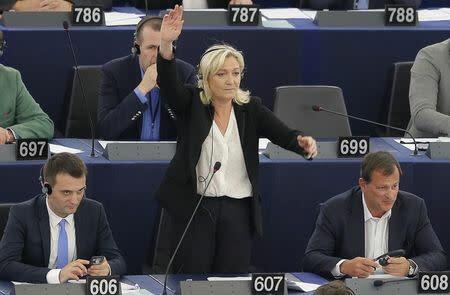 Marine Le Pen's anti-immigration, anti-euro National Front said it had formed a group called "Europe of Nations and Freedoms" after failing to do so a year ago, a move giving them extra funding, staffing and weight in the EU assembly. "Tomorrow in Brussels I will announce our group Europe of Nations and Freedoms," Le Pen said on her Twitter account, followed by similar tweets by her allies, including Dutch Freedom Party leader Geert Wilders. Le Pen and Wilders are expected to hold a news conference at 0900 GMT on Tuesday. Victories in the European Parliament elections by nationalist, Eurosceptic parties a year ago stunned the European Union's centrist politicians and have led to a fractured assembly, making it harder to pass legislation. While Le Pen initially failed to form a group in the parliament, a rival group of Eurosceptic parties that included Nigel Farage's United Kingdom Independence Party did forge an alliance, albeit a fragile one. To form a group, parties must have at least 25 to 30 members elected in at least seven EU member states. Chairing a committee is more difficult, requiring 40 to 50 seats, or even more to chair the most influential committees. Italy's Northern League will also be part of the new group, along with Le Pen's National Front, Wilders' Freedom Party, the Austrian Freedom Party and Belgium's Vlaams Belang. "We were five and it's been possible to add two other nationalities to form a group", National Front vice-president Florian Philippot told Reuters, without giving more details.